Mayor Michael R. Bloomberg announced plans to transform the long vacant Kingsbridge Armory in the Bronx into what will become the world’s largest indoor ice facility. The landmark armory, occupying a full City block, will be redeveloped into a 750,000-square-foot ice sports facility featuring nine year-round indoor regulation size ice rinks, including a main rink that can seat approximately 5,000 people. The new complex will be known as Kingsbridge National Ice Center (KNIC). When completed in 2017 KNIC will be used to host national and international ice hockey tournaments, figure and speed skating competitions and ice shows. It is expected that KNIC will draw more than 2 million visitors a year to the Bronx facility. There are currently only seven year-round ice rinks in New York City, however, none are located in the Bronx. The project will also include 50,000 square feet of space designated for community uses. The project will also include 50,000 square feet of space designated for community uses. The project represents a private investment of $275 million, which will generate 890 construction jobs and 267 permanent jobs, all of which will pay a living wage. 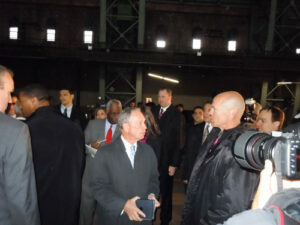 Joining Mayor Bloomberg for the announcement at the Kingsbridge Armory were KNIC Partners LLC Founder Kevin Parker, New York Rangers hockey legend Mark Messier, Olympic Figure Skating Gold Medalist Sarah Hughes, Bronx Borough President Ruben Diaz Jr., City Council Member Cabrera, New York City Economic Development Corporation President Seth W. Pinsky and Bronx Community Board 7 Chair Paul Foster. Capalino+Company played an important advisory role to KNIC Partners LLC working with numerous New York City government offices, elected officials and community related organizations to develop an overall project plan that could satisfy the diverse needs of the community and create a for profit ice facility that could be supported by private investors. Team Capalino included Founder/CEO Jim Capalino, COO Travis Terry and Senior Vice President George Fontas.